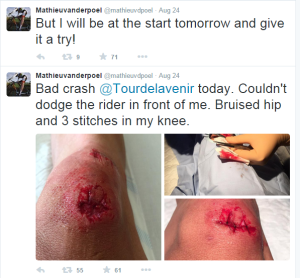 Current Cyclocross World Champion Mathieu van der Poel injured his hip and knee during a crash in the second stage of the Tour de l’Avenir. MvdP returned to his bike after the crash and finished the stage three minutes and eight seconds behind the leader, dropping him from fifth to 107th. A trip to the hospital following the stage revealed no broken bones. A knee that required stitches and a bruised thigh seemed to be the extent of the injuries. After leaving the hospital, he said he’d be at the start for stage 3. MvdP is scheduled to start his 2015-2016 season September 16 at the CrossVegas World Cup race. 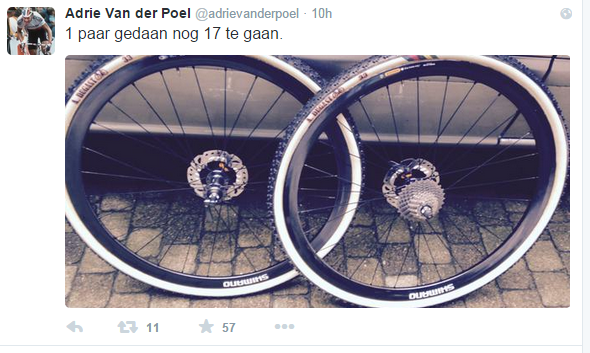 In other van der Poel news, Poppa Adrie has his hands full gluing tubulars for Mathieu and David. “One pair done, 17 to go.” Cross is Dad. I like your site update. Maybe you could add the submittal date to top of your posts so we know when you posted them? Seems to be a typical missed item for news posts all over the web… Not sure why. I’ve been following your site for 4 years now. Please keep it up! Love those technique videos. Encouraged me to ride my first amateur race season last year in Wisconsin!